Often in the world of motoring, we can feel at a loss about what we can do when our car fails. The usual course of action is to rush to the professionals, who we trust to bring our vehicle back to health. But some car failures are both preventable and easy enough to combat by oneself. Indeed, four of the most common such failures shouldn’t have you driving to the garage to part with your hard-earned cash. Below are listed these four malfunctions or issues, with their corresponding courses of action to get them repaired. It’s slightly embarrassing that many people in the US currently are unaware of how to change a flat tire. The whole process has been mystified to them. 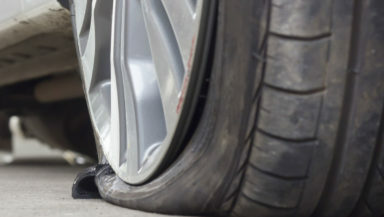 Happily, it’s actually a very simple process and – so long as you’re carrying the right equipment – you should be able to perform a tire change entirely on your own. Solution: Use the jack to raise the corner of your car that you’re working on. Use the key to undo the bolts on your tire. Remove the tire and place on the spare, tightening the bolts in the process. Voila – easy as that. A little less simple are cracks or chips that can occur at any time on your windshield. These are fairly unavoidable, although you should take care to drop back from vehicles ahead of you on grit-covered or gravel-paved roads. Solution: If you do experience a chip or a crack in your windshield, it’s at risk of shattering if you hit a bump in the road. In the worst cases, this can cause you an injury or even a car crash. Head over to www.utahwindshieldreplacement.com for their windshield replacement services to get your chipped screen seen to as soon as possible. Our friend the flat battery comes to visit once in a while, especially on older vehicles that are closer to the point of needing a replacement battery under the hood. To prevent you having to jumpstart, always ensure that all electronics are turned off – especially your car’s inside and outside lights. Solution: A flat battery can be dealt with in a number of ways. Many people choose to get a push or use downhill momentum to jumpstart their motor. In the absence of people or a hill, use your jump leads to connect to another car’s battery and get yourself back on the road. The most dramatic of the four issues listed here is the brake failure. A failure of our breaks can lead to dramatic crashes or, in parked positions, the rolling of your car due to a weak handbrake. Solution: It’s imperative that you have your brakes checked with regularity, and that any difference you sense in them is immediately checked upon. Do not drive a car with poor brakes – especially in the rain when brake distances are increased. Take it to a garage to be safe and sure. The four most common car ailments all have common fixes – you just need to know what to do in the moment, as this article explains.